'Dunlin' (John D.Taylor, R. 1977). Seedling #S.28/4. MDB, height 6" (15 cm). Early bloom. 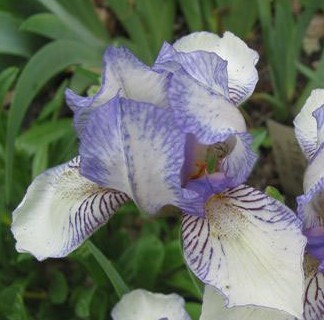 Standards blue; falls white, faint blue plicata markings. 'Mini-Plic' X 'Anne Elizabeth'. Sindt 1982. Second Vienna 1977; Honorable Mention 1986.
jpg 20170506_094640_(3).jpg manage 279 K 18 May 2017 - 04:07 HollyJohnson2017-04-01 MDB Dunlin - Photo by Holly Johnson, taken May 6, 2017 at the Minnesota Landscape Arboretum, zone 4b. Bloomed thru 5/20/2017.